The Korean giant has reported its first annual profit slump in three years. It’s not always easy being the market leader. As more agile competitors innovate and challenge the established way of doing things, is can be a struggle holding on to that mamoth market share you fought so hard for. That’s the reality facing Samsung, the world’s biggest manufacturer of smartphones. Today the Korean electronics giant said its operating profit for the fourth quarter of 2014 was likely to be around 5.2tn Korean Won (£3.1bn), a 37% fall from the previous year. This is likely to drag the company’s annual profits down to 24.9m Won, 32% decline lower than 2013. Its Galaxy range of smartphones has been losing market share to cheaper rivals like Huawei and Xiaomi, a problem particularly compounded by the growth of the Chinese middle class. On Monday Xiaomi announced its turnover had doubled in 2014 to almost $12bn (£7.9bn), despite being founded just four years ago. It's now worth $45bn. How can Samsung respond? On the one hand it could try to get innovative. As Apple proved with the iPhone and iPad, it’s not beyond large companies to turn a product category completely on its head, so perhaps Samsung has a whole new take on mobile communication in the works. Otherwise it might be forced to explore other avenues. 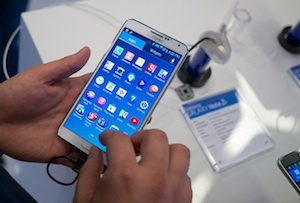 ‘It's time to see Samsung as a semiconductor company,’ said Lee Sei-cheol, an analyst at Woori Investment & Securities. That part of Samsung's business overtook smartphones as its most profitable division this year, a trend that is expected to grow. If it can maintain this momentum then it might not give two hoots about the Chinese challengers yapping at its mobile heels.